Any good economist will tell you that as complementary factors of production, labor and capital are not only indispensable but hugely dependent upon each other as well. Capital without labor means machines with no operators, or financial resources without the manpower to invest in. Labor without capital looks like Haiti or North Korea: plenty of people working but doing it with sticks instead of bulldozers, or starting a small enterprise with pocket change instead of a bank loan. Capital can refer to either the tools of production or the funds that finance them. There may be no place in the world where there’s a shortage of labor but every inch of the planet is short of capital. There is no worker who couldn’t become more productive and better himself and society in the process if he had a more powerful labor-saving machine or a little more venture funding behind him. It ought to be abundantly clear that the vast improvement in standards of living over the past century is not explained by physical labor (we actually do less of that), but rather to the application of capital. This is not class warfare. I’m not “taking sides” between labor and capital. I don’t see them as natural antagonists in spite of some people’s attempts to make them so. Don’t think of capital as something possessed and deployed only by bankers, the college-educated, the rich, or the elite. We workers of all income levels are “capital-ists” too—every time we save and invest, buy a share of stock, fix a machine, or start a business. That’s not to say there aren’t bad eggs in the capitalist basket. Some use political connections to get special advantages from government. Others cut corners, cheat some customers or pollute a stream. But those are the exception, not the rule, in a society that values character. Workers are not all saints either—who among us doesn’t know of one who stole from his employer, called in sick when he wasn’t, or abused the disability or unemployment compensation rules? Those exceptions shouldn’t diminish the importance of work or the nobility of most workers. Like most Americans, I’ve traditionally celebrated labor on Labor Day weekend—not organized labor or compulsory labor unions, mind you, but the noble act of physical labor to produce the things we want and need. Nothing at all wrong about that! But this year on Labor Day weekend, I’ll also be thinking about the remarkable achievements of inventors of labor-saving devices, the risk-taking venture capitalists who put their own money (not your tax money) on the line and the fact that nobody in America has to dig a ditch with a spoon or cut his lawn with a knife. Indeed, what could possibly be wrong about having a “Capital Day” in odd numbered years and a “Labor Day” in the even-numbered ones? 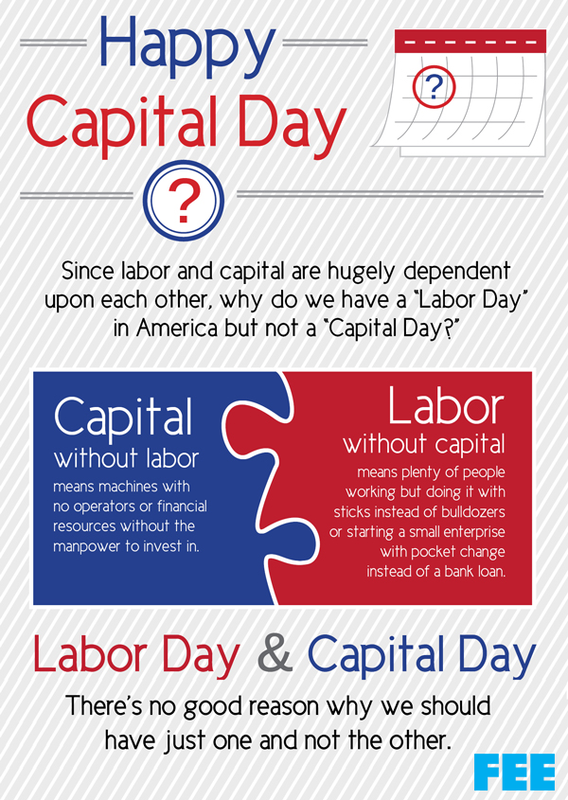 Labor Day and Capital Day. I know of no good reason why we should have just one and not the other. This article first ran on September 3, 2012. As the Bolivar continues to lose value, Venezuelans rely more and more on Bitcoin. How Should President Trump Handle Immigration? Make It Easier.